Christopher Donatiello, a former New York based wine and spirits distributor, has teamed with investment banker Bill Hambrecht to totally transform the site of the former Belvedere Winery on Westside Road in Healdsburg. Belvedere Winery was acquired by Bill Hambrecht in 1989. The spectacular 14.5-acre estate had an organically farmed vineyard, a contemporary wood and glass hospitality center and tasting room designed by noted winery architect and landscaper, Ken Munson, and an organic garden that introduces visitors to flora that have a natural affinity for the aromas found in the Burgundian varietals. The existing winery facility was upgraded and outfitted with the latest in winemaking technology. A soft launch of the label occurred in April, with the official Grand Opening celebration taking place on June 21, 2008. 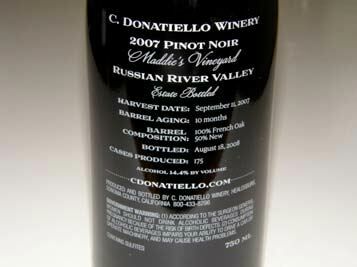 The focus of C. Donatiello Winery initially was small lot Pinot Noirs and Chardonnays from the organic estate vineyard and specially chosen vineyards in the Russian River Valley. Two very talented winemakers were on board at launch. Winemaker Troy McEnery has years of experience at Gallo Sonoma and Belvedere, and Associate Winemaker Webster Marquez developed his skills at Williams Selyem and now is partnered with two other winemakers at Anthill Farms. The entire operation was very classy with considerable thought given to a distinguished image and tasteful presentation of the wines. Unfortunately, in 2012 the winery was closed and became the VML winery. Chris Donatiello was in limbo for awhile but has landed on his feet. 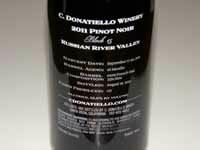 In January, 2014, after fours of working together, Bill Hambrecht and Chris Donatiello parted ways and Chris took over complete ownership of the C. Donatiello brand. Webster Marquez is still the winemaker and many grape contracts such as Hervey, Tina Marie, Windhorse and Peters vineyards are still in place. The production is no longer at the previous facility on Westside Road. Tasting is available at Vin Couture on the Plaza in Healdsburg. A new website was launched in February 2014. 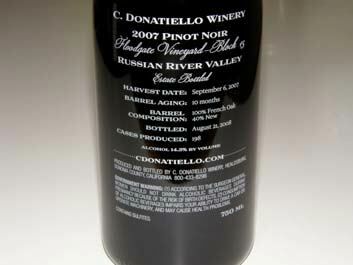 The wines are sold on the website.